In fondest memory of Michael Meacher who died on Tuesday – he was a ‘good-un’. And this must have been one of the craziest, most magnificent demonstrations ever. Michael organised with David Winnick MP and Kelvin Hopkins MP to demonstrate at Chequers against the Bedroom Tax. 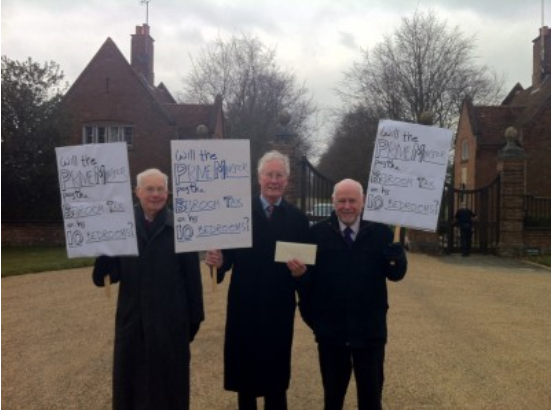 Three gents of a certain age, turning up at the PM’s country residence with their home-made posters! After security had got over their shock and put down their guns, they helped unload the car and offered the three a cup of tea… a very British protest. RIP Michael Meacher. You were highly valued, loved and respected. You will be much missed.